Health Save Blog - Total Care. Inside and Out. 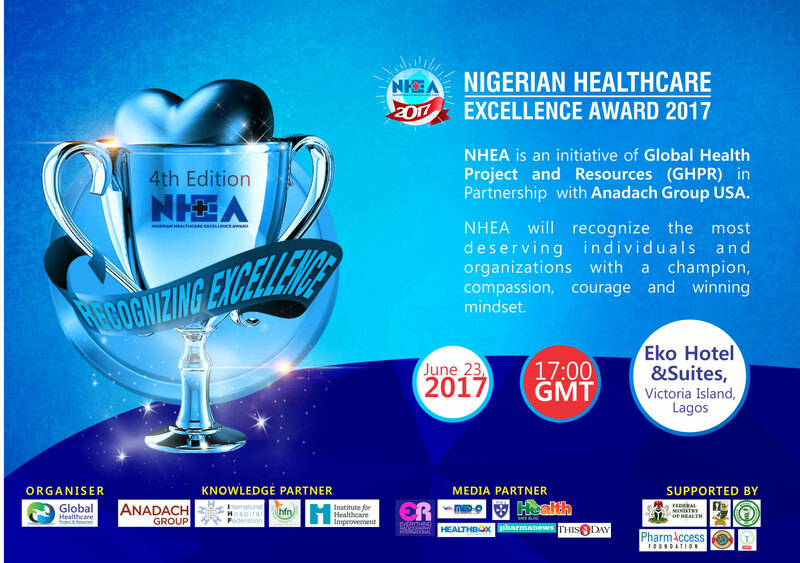 Nominations for the 4th edition of the Nigerian Healthcare Excellence Awards (NHEA 2017) has opened. 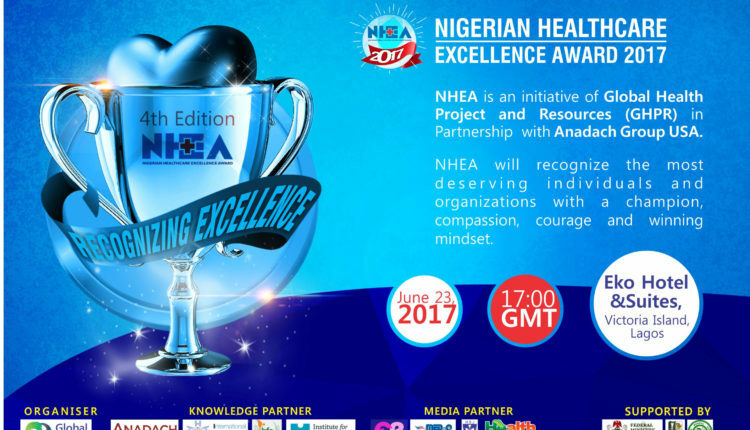 Stakeholders in the health sector have been advised to visit www.nigeriahealthawards.com.ng to either make their nominations online or download the nomination form. Winners of the various categories will be honoured on Friday, June 23, 2017 at Eko Hotel & Suites, Lagos. Nominations will close on May26, 2017 before the commencement of online voting to enable the award jury select the winners of the various categories. About 23 awards and recognitions will be presented at the ceremony. It is made up of three main categories; Special Awards, Healthcare Delivery Services and Biomedical Technology. Some of the awards up for grabs include; The Lifetime Achievements Award, Outstanding State Government Healthcare Programme of the Year, Outstanding CSR Health Project of the Year, Healthcare Media Excellence (print & electronic), Private Healthcare Provider of the Year, Public Healthcare Provider of the Year, Laboratory service provider of the Year, and Radiology Service Provider of the Year. Others are; Biomedical Engineering Service Company of the Year, IVF Service Provider of the Year, Dialysis Service Provider of the Year, Eyecare Service Provider of the Year, Laboratory Equipment Marketing Company of the Year, Nursing & Midwifery Excellence Award of the Year, etc. In NHEA 2016, Professor Olu Akinyanju of the Sickle Cell Foundation Nigeria and Prince Julius Adelusi-Adeluyi of Juli Pharmacy were honoured with the NHEA Lifetime Achievement Awards. NHEA is organised by Global Health Project and Resources (GHPR) in collaboration with Anadach Group, USA. I am Temilola Waliu Globalwalyy, a Blogger, entre and social preneur. A Content & Information philanthropist. The founder of Tecky Planet, A Digital Marketing and SEO Firm. The Chief Editor of Health Save Blog, one of the largest health blog in Africa. Vitamin D Deficiency is Everybody’s Concern; Your Way Out! Just the Right Moment: When Is the Best Time to Work Out? 10 Ways to Restore Your Peace of Mind and Reduce the Stressors in Your Life. End of Life Options: What Options Are Available to You? Healthsaveblog.com is dedicated to bringing you the greatest quality health information online. HealthSaveBlog delivers a lot of health-related information for the readers in the clearest, jargon-free and easy to understand language (English), so it is engaging and very clear to the readers. The content that will be covered on this website is all about health from cancer, diabetes, weight loss, and exercise to mind and body health. HealthSaveBlog is Under Tecky Planet Management. Tecky Planet is an experienced and well established Digital Marketing, Social Media & website design company specializing in web design & digital marketing. Health Save Blog © 2018 - All Rights Reserved. Stay Connected to Health Save Blog!